Welcome to my Mosaic Class page! Beginning and Intermediate students are invited to come on any date listed below to create mosaic art on a stepping stone, garden pot, heart, mirror, lazy susan, garden marker, fish or Mission Inn. Your pick. Everyone can be working on a different project! Classes are ongoing....please e-mail me with your preferred date and project choice. Dates, registration information, projects and class fees are below. Questions? Please feel free to call me at (951) 398-8875. Address plaques and other projects are available for private one-on-one workshops. Fee - $25 per hour. I have been teaching Beginning Mosaic Classes since April 2010. Thank you to all of my new and returning students for continuing to take classes with me and making my job such an enjoyable one! The classes take place at our home studio in Riverside, California. I have also taught classes at the Riverside Art Museum, the Arc of Riverside and many schools in the Riverside Unified School District's After School Program. The classes include instruction on safety, tools, methods, materials and grouting in an informative, fun and relaxed atmosphere. First day-10 a.m to 3:00 p.m.
Second day -10:00 to 12:00 p.m.
12" x 12" heart ($135) NEW! I have a large selection of materials for you to choose from and I also encourage students to bring any tiles, broken china, jewelry or interesting found objects. These garden markers are fun to create and will add some pizzazz to your garden or potted plants! Each garden marker is 6" x 6" and will be attached to a 25" garden stake. Some of the images include an ocean turtle, a dove, a dragon fly, a fish, an ocean sunset, a whale tail and a flower. Create three garden markers in this workshop. The theme of the workshop is Mosaic Fish Fantasy! Each student will have the opportunity to create a unique and colorful fish. Your custom-cut fish will measure approximately 25 inches by 10 inches. Our studio offers a huge variety of ceramic tiles, vitreous glass, penny rounds and gems to make your design a one-of-a-kind beauty! Feel free to bring in your own broken ceramics, plates, jewelry and any other found objects to incorporate into your piece. This is a sample of the wall art you will create in this class. 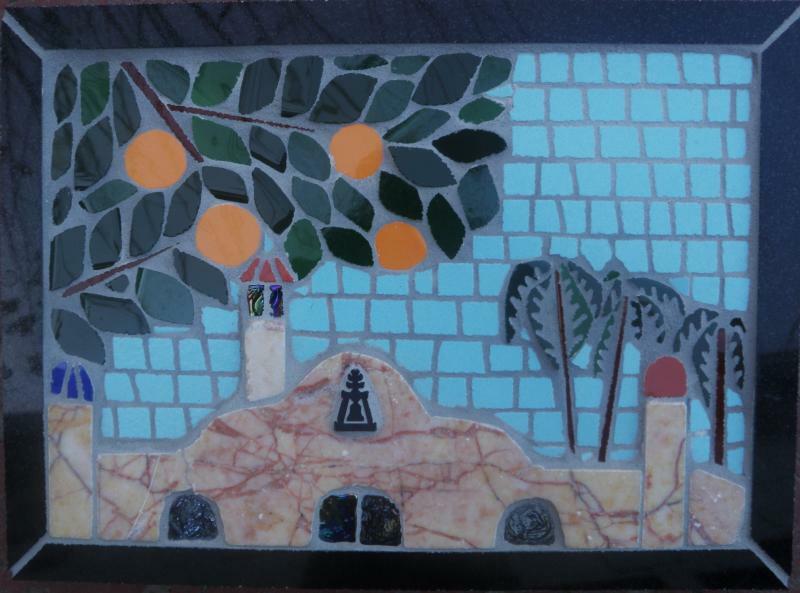 Most of the pieces are pre-cut by us, but each student's art will be different (the color of the Mission Inn, the sky, the frame, as well as the placement of the orange tree and palm trees). Dimensions: 10" by 12"
Please bring a lunch for the first day workshop.